Earn 10.2 SB per $ when you buy ProAm Golf gift cards at MyGiftCardsPlus, powered by Swagbucks. 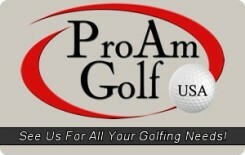 Pro Am Golf USA has been in business for over 35 years and is independently owned and operated. Our knowledgeable staff offers a level of service and familiarity that can’t be matched by the larger warehouse style retailers. We can assist in answering any questions you may have about different products and will make sure that you get the best equipment to suite your game. On top of this service we carry all the major brands like Taylormade, Ping, Cleveland, Callaway, Nike and many, many more.